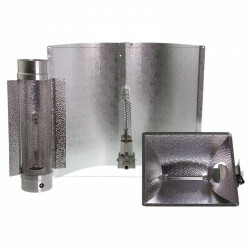 We offer the convenient dual lamp, which contains a metal-halide and sodium-vapor lamp at the same time. In addition, this category also includes fluorescent tubes that are usable for all growth stages, from seedling to the vegetative growth phase. 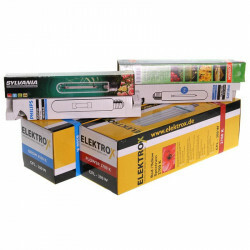 Of course, we have suitable ballasts in conventional or electronical form, for any kind of illuminant, available as well. 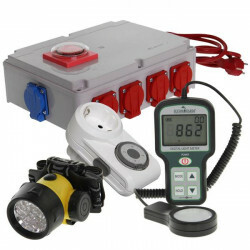 The function of ballasts, is to be connected in series with the lamp, to limit the electricity of the lamp to its rated value. 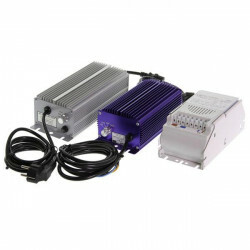 Electronical ballasts are dimmable and deliver higher light intensity at a smaller power consumption. Conventional devices stand out due to their longevity. Furthermore, you are also able to obtain reflectors for the optimal lighting of the cultivated area, to increase the efficiency during growth and flowering phase. 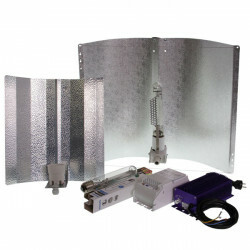 Beyond that, reflectors reduce the irradiating heat by distributing the light evenly. Here are also different types to be distinguished. The hammered finish reflectors generate, due to the special lamination, a high light output through the maximum reflection. The biggest model is the Avenger Large for lamps with up to 1000 watt that is able to illuminate four square meters of plants. Cool tube reflectors are integrated into the ventilation system, so that heat gets sucked off. They are perfect for smaller rooms. 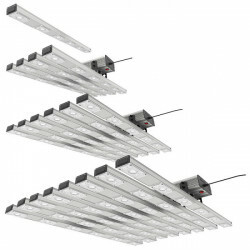 Available are accessories for lighting systems, as well as complete lighting systems, and illumination sets that are well matched for any growth or flowering phase.